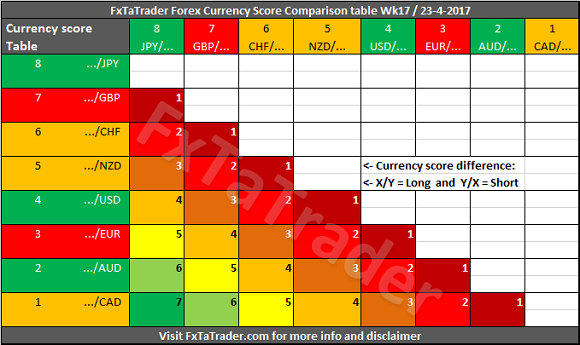 In the Currency Strength table, the JPY was again the strongest currency while the CAD was the weakest. There were some significant changes last week with the CHF gaining 4 points and the EUR 2 points. The AUD lost 5 points and the CAD 2 points. The other currencies remained around the same level of last week with a maximum difference of just 1 point. When looking at the Average 13 wks. Score the AUD remains the strongest of all even after having to weeks of a low score during the last 3 weeks. The EUR remains the weakest and after that the GBP which had 4 strong weeks in a row lately. The currencies are grouped together around a level which makes clear to what classification they fit best. It is clear to see in the Avg. 13 wks. values to what groups the currencies belong. This week we take a look at the strong currencies. The AUD is very volatile lately by going in the last 4 weeks to scores of 7 and 2. These are scores resp. in the Strong and Weak range. The USD is less volatile but is lately having more scores in the range of Neutral currencies with sometimes making a top in the range of the Strong currencies. Actually, this is the case in the last 13 weeks. In the 13 weeks before that, it was clearly almost all the time in the range of the Strong currencies. The JPY is clearly back on track after the strong dip it had in December last year. 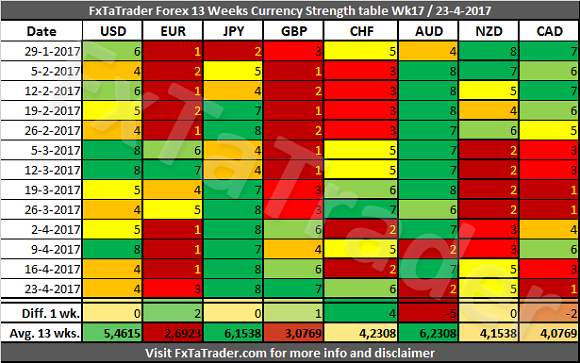 It is the strongest currency of last week and the second strongest when looking at the Average 13 wks. score being close behind the AUD. The JPY had in the last 6 weeks 4 scores of 8 and 2 scores of 7 and in the 6 weeks before that scores within the Neutral and Strong range. 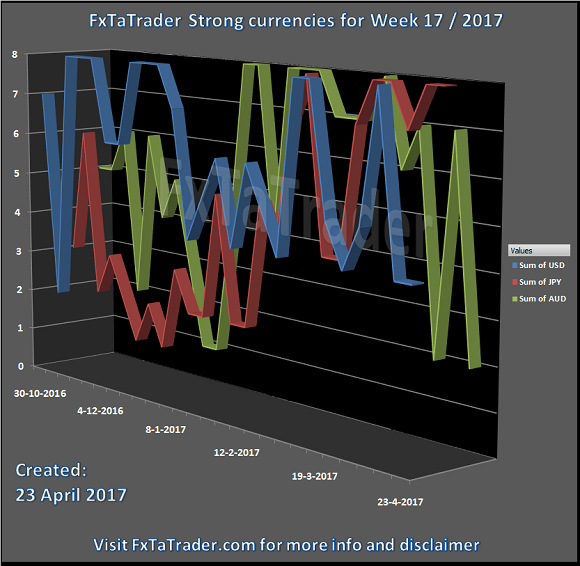 For the moment these currencies will remain strong and it seems that the JPY may become the one with the highest Average 13 wks. score in the near future. The USD is the weakest of the Strong currencies by having a score of around 0,5 point lower to the other strong currencies. However, it is still too far from the neutral currencies to become one in the near future.